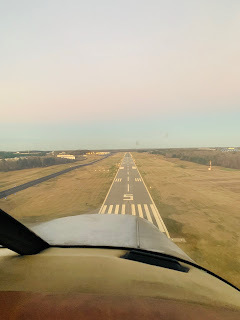 The weather has been bunk lately so not much flying, but if you've been following along on the blog I've updated a few videos of our recent flights. The reason for this is that I really need more exposure to controlled airspaces. I want to get more familiar with them particularly as I begin to venture outside of my 'home turf'. One of my buddies who is also a CFI and majors Pilot has started working with me on this and you can see him in the last video as we took a late evening flight. He's really pushing me (in a good way) to really expand on my flying and get more comfortable with not only the plane but experiencing new things...such as flying in late evening (dusk) and getting controlled work. As such he organized a tour of the KCLT tower for me and a few friends from Monroe. This is the actual radar station that the controllers use. They have many of these stations and this one was tuned to Monroe. I was able to apologize in person to the guy I get flight following from to go 20nm in my 85mph airplane. LOL (KEQY->KUZA) I was finally able to visualize what the systems do when they hand you off between the different airspaces. Here is what the supervisor sees he will see all planes heading towards the airport (in this case KCLT) and can pull up any radar and any 'screen' he needs to fit all the guys in.